A bird on a tether, no matter how long the rope, can always be pulled back. The American Pipit (Anthus rubescens) is a small songbird found on both sides of the northern Pacific. 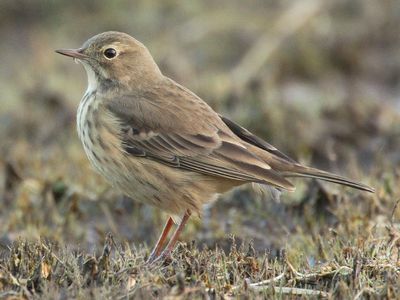 The American Pipit is similar to the Sprague’s Pipit but the Sprague’s Pipit has much less streaking on the underparts, more streaking on the back, a paler face, and pink legs. The rare Red-throated Pipit (breeds in Alaska and rare migrant in California) has a different call and pink legs. Sparrows and longspurs can be found in similar habitats but have thick, conical bills. The American Pipit spends its winters on the Pacific coast of North America, and on the Atlantic coast from southern USA to Central America. The American and Asian subspecies of the Puff-bellied Pipit are rare vagrants to Western and Eastern Europe, respectively. American Pipit, bird quotation, bird quote, Ronald Reagan quotation, Tether. Bookmark.